What’s not to love about soup? It’s a one pot dish that versatile and warms you up from the inside out. Every time that I make soup it’s always a different combination; I almost never make the same soup twice! I’ve shared a different corn soup, a beef soup, chicken tortellini soup and a split peas soup in the past. I usually add whatever vegetable or meat that I feel like eating at the time. 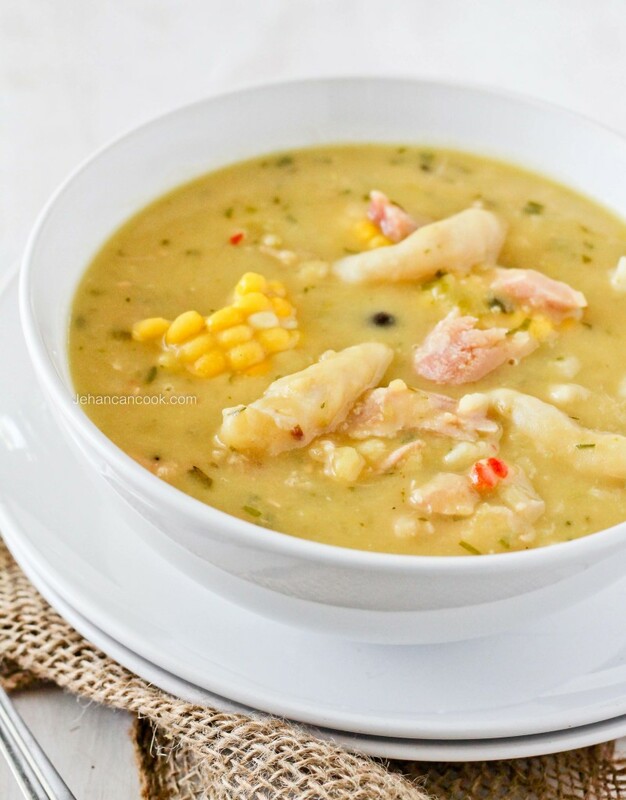 For this soup I used corn, potatoes, split peas and smoked turkey wings! The split peas melt in the cooking, thickening as well as flavoring the broth while the turkey wings add a rich smoky element. 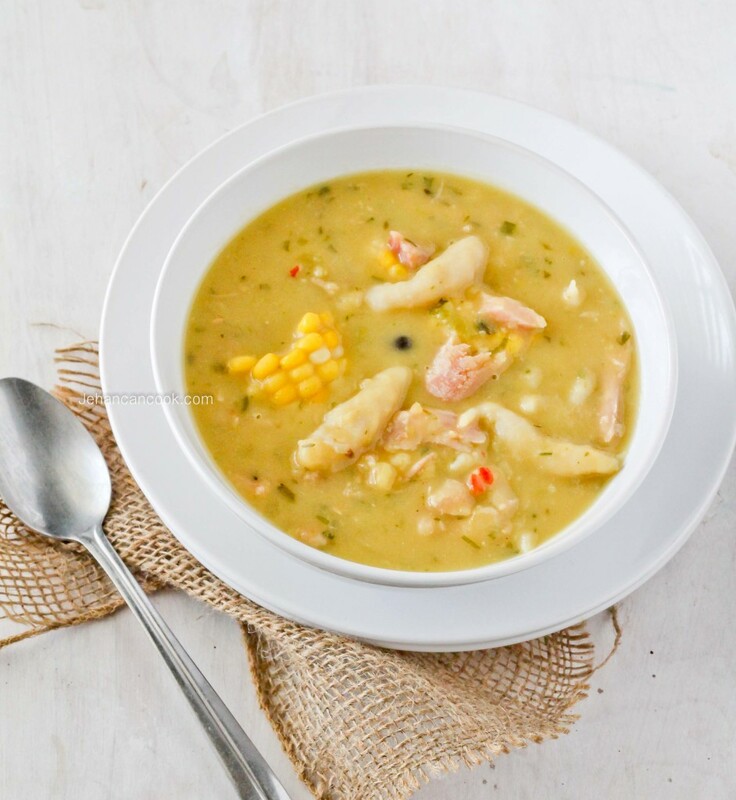 In most households in the Caribbean, it is traditional to eat soup on the weekends. The type of soup varies from household to household. Do you make soup on the weekends? What’s your favorite soup? In a large pot over medium heat, place smoked turkey wing, split peas and water and bring to a boil. Cook until peas are tender and easily crushed when pressed between the fingers. Next add potato, corn, onion, garlic, thyme, scallion, cilantro, pepper, pimento, bouillon and cook until potato soft. Add dumpling and cover soup. Reduce to a simmer and for 10 minutes, the dumplings will float to the top when done. Remove from heat. Remove the turkey wing from the soup and when it is cool to touch shred the meat, using a fork. Add meat to the soup and serve! Place flour in a bowl with salt, sugar and baking powder then mix to combine. Using a fork, cut margarine into flour until it resembles coarse cornmeal. Add 1 tsp chopped parsley and milk; using your hands mix to form dough. Roll dough into a log, and then cut into 1 inch pieces. Roll between palms to form the dumplings. Add to soup last 5 minutes of cooking. We had this for dinner last night, and it was awesome! The smoked turkey wing allows for such a hearty flavor without spending a ton of time cooking. And I’m such a sucker for anything with dumplings in it. We’ll definitely make it again – soup is on my meal plan every week once fall/winter starts. Thanks for posting this recipe! Thanks Erin, I’m so happy to hear that you loved it! Can I tell you how envious I am that you get smoked turkey? Haven’t seen it ANYWHERE in Dubai. That means I have not eaten it in SIX years and I absolutely LOVE smoked turkey. It just makes the world a better place! This soups looks fab.